Olive Oils are graded by production method, color, and flavor. 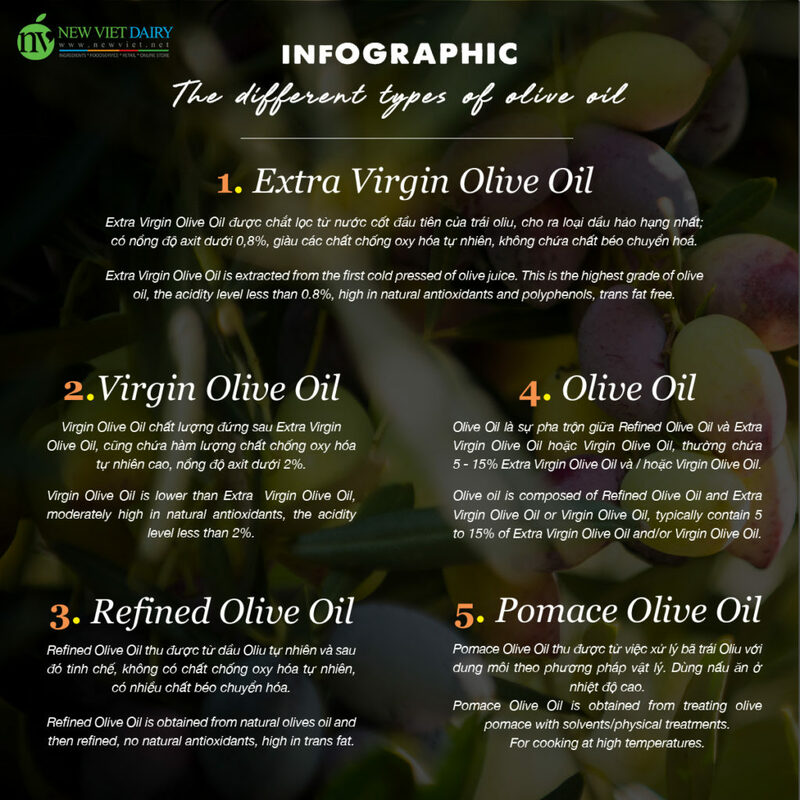 In general, there are five popular types of Olive Oil. Extra Virgin Olive Oil is extracted from the first cold pressed of olive juice. This is the highest grade of olive oil, the acidity level less than 0.8%, high in natural antioxidants and polyphenols, trans-fat-free. Virgin Olive Oil is lower than EVOO, moderately high in natural antioxidants, the acidity level less than 2%. Refined Olive Oil is obtained from natural olives oil and then refined, no natural antioxidants, high in trans fat. Olive oil is composed of Refined Olive Oil and EVOO or VOO, typically contain 5 – 15% of EVOO and/or VOO. Pomace Olive Oil is obtained from treating olive pomace with solvents/physical treatments. For cooking at high temperatures.